Back pain is hard to live with. Chronic back pain is debilitating. You may have an idea of how it happened, or no idea at all. 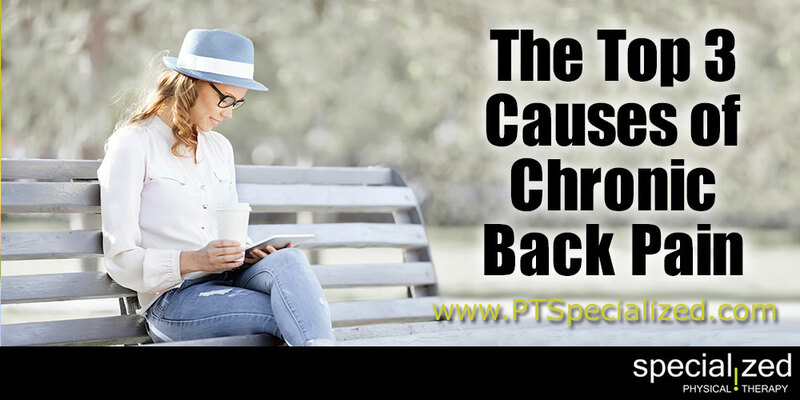 But there are causes for chronic back pain, and here are a few of the top ones. Whether you fell, injured during sports or in a car accident, injuring your back can mean weeks or months of pain. Minor injuries, like a pulled muscle, can add up and cause continual pain. Other injuries can be more severe and require more intensive therapies or treatment, even surgeries. Most can be treated with anti-inflammatory medication and rest. Some may just be bad enough to warrant physical therapy. In many cases chronic back pain can just come from normal wear and tear due to how you choose to live. Choices like not exercising regularly, overeating, poor posture and a sedentary lifestyle. Your job may require you to sit for hours. Using a computer for hours at a time can affect posture. Standing for too long can also be a problem. Repetitive tasks like lifting, pulling or pushing can cause back issues. Bad habits like smoking make it difficult for nutrients to keep the disks in your back healthy. Eating junk food also hurts you by causing weight gain and lack of good nutrition. One or more of these factors, over time, can lead to damage to your spine. Physical therapy can do things like teach you better ways to lift, push and pull heavy items. It can help you with posture problems, help you with better ways to handle a job that encourages being sedentary. Of course, it can also help treat the root issue and improve mobility, flexibility and strength. Get a FREE Pain Assessment from Specialized Physical Therapy!